Unless you've been living under a rock for the last six months you'll know that 2010 is a huge year for thrash. Not only is the genre as strong as ever three decades on from its inception, the big four innovations of the scene - Metallica, Anthrax, Megadeth and Slayer - have shared the stage together for the first time in their history at a set of recent shows. 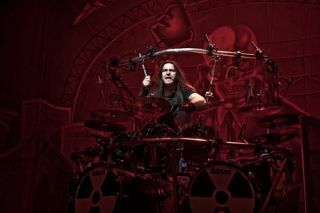 To celebrate the genre's purple patch (as well as our killer thrash drumming cover feature), we caught up with Megadeth drummer Shawn Drover to get the inside word on how to play thrash. Shawn's position as a fan of the early thrash scene through to ultimately linking up with his heroes in Megadeth means he's just about the perfect person to guide you through the nuances, challenges and skills needed in the ground-breaking genre that changed the face of metal drumming forever. What were your thoughts on thrash as it first developed? "Obviously double bass drum and all that speedy stuff was defined around the time that thrash started. Dave Lombrado, Gar Samuelson (former Megadeth drummer), Lars Ulrich and Charlie Benante were the four pioneers of all of that. They were making the heaviest music on the planet." What particular skills are required for that style of drumming? "It requires a lot of patience and a lot of practise. You can't just say 'I'm playing at 160bpm now', which at the time was incredibly fast. It's always good to practise to a metronome. It's not too expensive to get that stuff nowadays. If you're playing at that velocity you want to keep steady because the faster it is, the harder it is for the guitarist and bassist to play all of those wacky notes. Megadeth is a good example of that, there's so many notes going on. If you play too fast things can really sound like havoc." Is pacing a key aspect? "A lot of young drummers, especially back in the day, had that runaway train syndrome where they'd start fast and by the end of the song it'd be just so fast. It's kinda cool in the spirit of punk and thrash I guess, but with Megadeth there's so much precision, you need to deliver and develop a solid meter. As well as working on your chops, the ride, the double bass and all that stuff." What advice do you have for young thrash drummers? "If you're playing a thrash song that's 150bpm, maybe try playing it at 130bpm and then bump it up to 132bpm. That's a really good way to monitor your progress and help you have a good meter." How do you think thrash has progressed in the last 25 years? "These days the bands are playing so fast that it's mind-boggling. I couldn't even fathom doing that. I have no interest in it because that's not what I do, but my hat goes off to them. These kids in the young bands must practise a hell of a lot more than I do!" Is speed the key progression? "It's certainly a speed progression. I love it, it's how they express themselves. Speed equals aggression in a lot of cases and the big four pioneered that. What you hear now started with those four bands. I think a lot of it's great but I wouldn't want to go through the workout to play at 250bpm." Is there much adjustment needed in your natural style when playing songs from around the start of thrash? "Yeah, it takes a lot of practise to play that stuff. You can't just jump on and pull it off with no rehearsal. When we're playing Rust In Peace we refine it backstage and even now I listen to the record and think 'I don't play that fill like that!". It's work but the pay off is great. Nothing worth having is easy, else we'd all be brain surgeons!" Who were your key drumming influences when you were starting out? "Neil Peart was the reason I picked up drums. The first live Rush record made me want to become a drummer. I'm a huge fan of Roger Taylor and Queen as well. Then I got into Tommy Aldridge, Ian Paice, Cozy Powell, all the cats from the 70s and a lot of jazz guys like Simon Phillips and Steve Gadd. I got into jazz at the same time as rock and metal and I think it helped me develop. You should take little pieces from drummers you admire and incorporate it into your style." Are there any up and coming thrash and metal drummers that have caught your eye? "A guy I like is Tim Yeung, who used to play with Divine Heresy. He just does it with no effort. It's insane." What is the one tip you'd give to people trying to get your drum sound? "One thing I do use ghost notes on the snare. It helps me keep my meter, but the faster you get you can't really throw them in. When I use them I know I'm going along a straight line and I know I'm not speeding up." For more on the history of thrash drumming pick up the latest issue of Rhythm, which includes a seven-page Big Four feature.